John Rylands Library, Manchester. Fuji X-T2, 10-24mm at 12mm, ISO800, 1/3″ at f/7.1. Handheld leaning on the stair handrail for support. I have been experimenting with DxO Photolab again. I really like the software but before I can commit to buying it, I need it to support the Fuji XTrans RAW file format. If I can’t process the Fuji X-T2 files, it’s only going to work for a fraction of the images I shoot. Then I had an idea. What if I convert the RAW file to DNG first using Iridient XTransformer. I felt sure I had used a much earlier version of DxO to process RAW files. Unfortunately, my excitement was short lived. DxO Photolabs couldn’t read the file. So instead of writing about a great work around, I’m going to share an image shot with the Fuji X-T2 and converted in Lightroom. This has then had a little post processing with On1 Photo Effects to emphasise the shadows. The stars around the lights were enhanced very slightly using Topaz Star Effects. John Rylands Library, Manchester. Fuji X-T2, 10-24 Lens, ISO800, f/6.4, 1/6″ leaning on the handrail. Post processing with Topaz Star Effects and Nik Viveza. Yesterday was a trip into Manchester to shoot some interesting architecture. It was a great day out even though one of the best locations was indoors. I have a few shots from the day that I will be sharing but this one was early on. 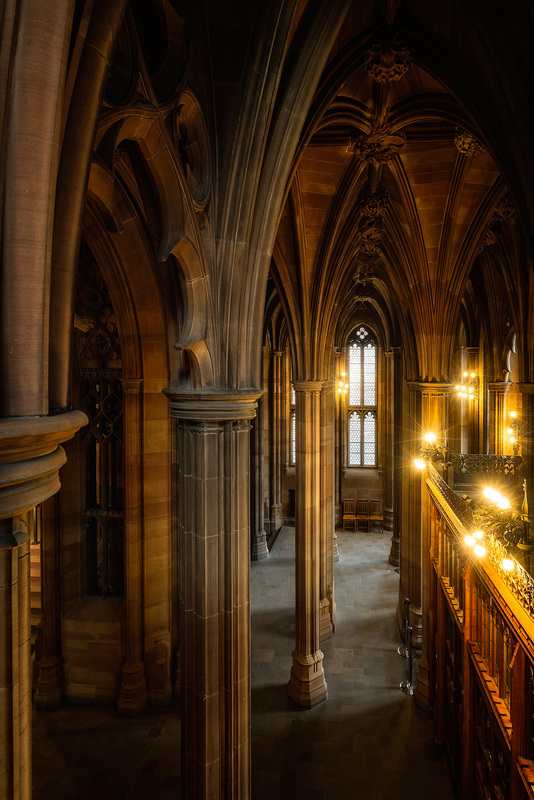 It’s from inside John Rylands library who are quite happy for you to take photographs providing you keep out of people way – full credit to them. If you’re ever in Manchester, it’s a great place to visit. I have shot this staircase in the library several times, but I wanted to try it with the Fuji X-T2. Previously I have only used either a compact or Micro 43 camera. The Fuji handles the noise very well and 10-24 lens allowed for a great perspective. I hope you like the shot and have a great weekend.